Produced for only three years between ’81 and ’83, the Honda Motocompo has become a cult favorite. While Honda offered a handful of other micro-displacement machines at the time, the Motocompo was different for a myriad of reasons that make it arguably one of the quirkiest scoots of all time. 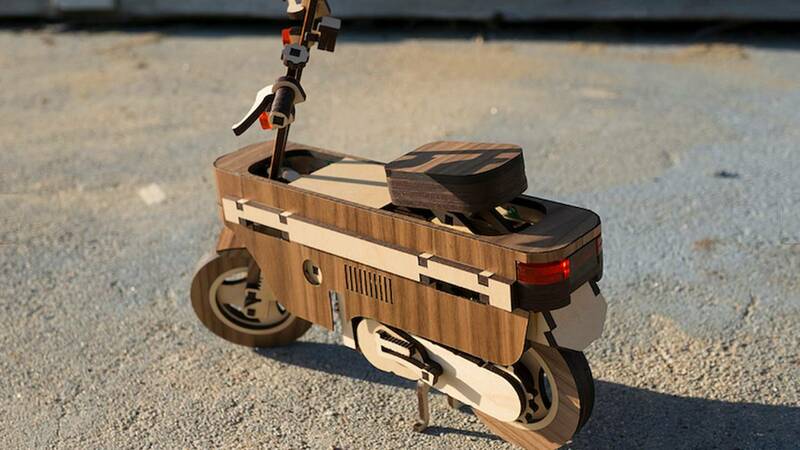 Now, one drawing professor at Pasadena’s prestigious Art Center College of Design has just released an incredibly detailed, limited edition, laser-cut, wooden model of the Motocompo that captures the tiny scooter in excruciating, wooden detail. The kit is the brainchild of Kirk Shinmoto who, in addition to teaching drawing at the Art Center College of Design in Pasadena (and the Concept Design Academy), also heads up the Kirkshop. Prior to churning out awesome wooden models, Shinmoto worked in the animation industry where he held some pretty noteworthy positions at big-name outfits like Dreamworks Animation and Titmouse Studios. 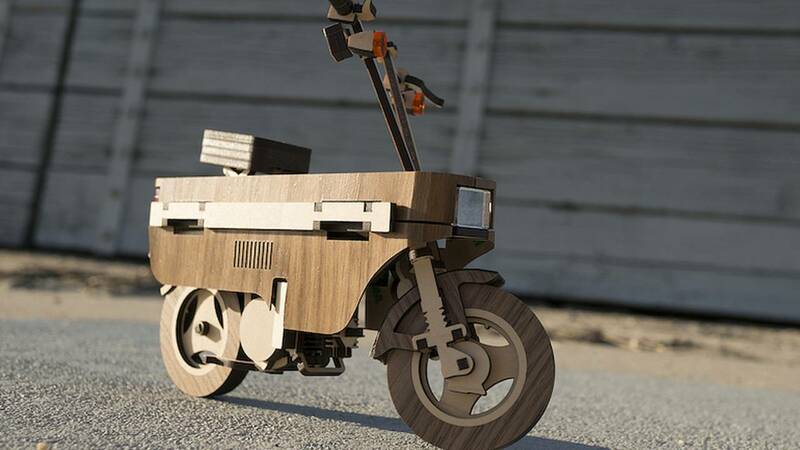 To understand why this wooden model is so cool, it helps to have at least a tenuous grasp on the Motocompo. 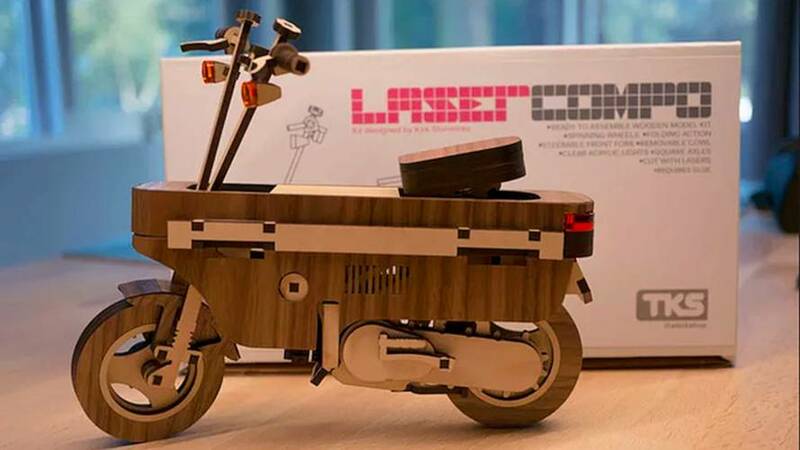 First released in 1981, the ‘Compo was a peculiar little folding scooter that was designed to stow away inside the trunk of then-current subcompact car models like the Honda Today and City—the latter of which was specifically designed to accommodate the Motocompo. Aside from the boxy shape of the bike, its most noteworthy features were probably its collapsible handlebars and seat. The Motocompo was powered by an air-cooled, 2.5 horsepower, 50cc, two-stroke, oil-injected single that was married to an automatic transmission, and boasted a wet weight just shy of 100 pounds. 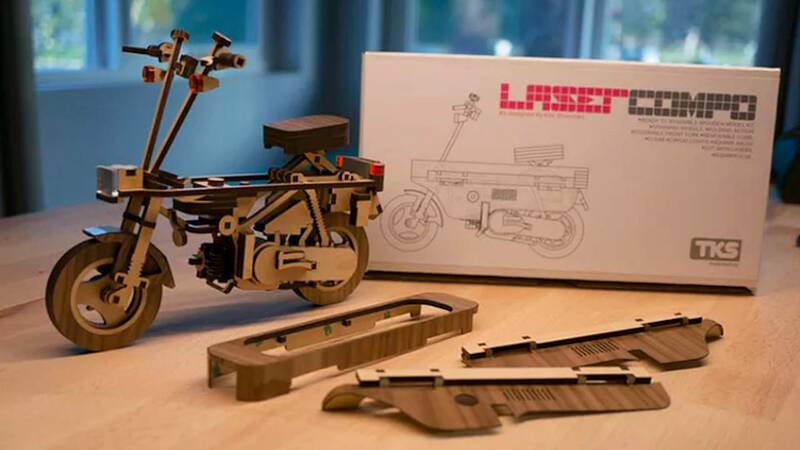 The 180-piece kit is comprised of precisely laser-cut parts made from finished maple, walnut plywood, finished walnut veneer, and a few acrylic odds and ends. 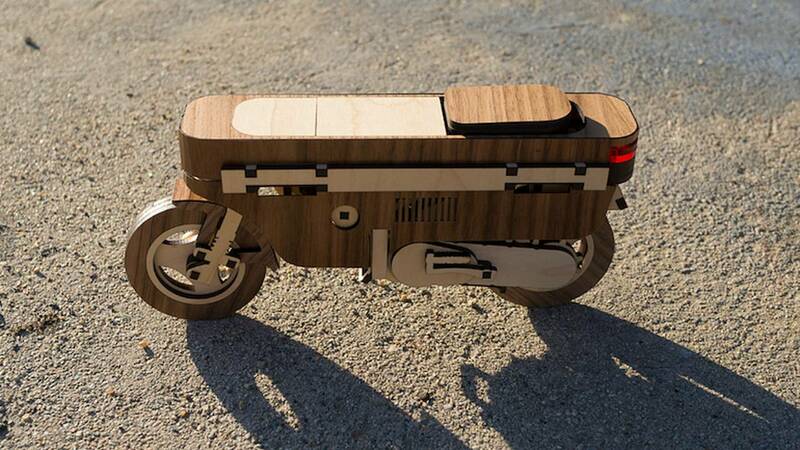 According to the manufacturer, the kit takes between two and three hours to build—thanks to detailed instructions and a color build guide—and only requires super glue to complete. The “Lasercompo” is impressively detailed too, sporting removable cowl panels that reveal fully detailed internals. The handlebars and seat both employ folding mechanisms just like on the real thing, plus the steering function actually works and the wheels actually spin. Interestingly the model also allows for multiple configurations for the kickstand and footrests. 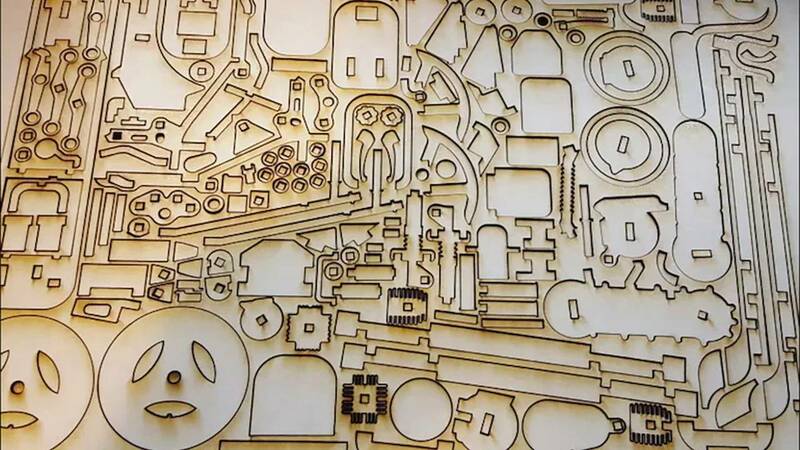 The choice to laser-cut the parts was a natural one, as precision was key with all the moving parts and mechanical elements, which is why the original renderings were designed in CAD. Examples of the Lasercompo are available for purchase on the Kirkshop website for $70 a pop. 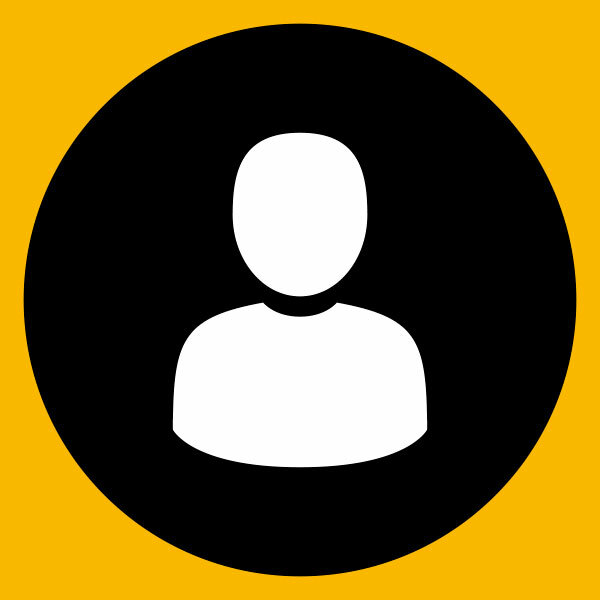 The site does point out that because of “an unexpectedly high influx of orders there may be a delay of up to one week for shipping out new orders". To see more photos or to order your own Lasercompo off the Kirkshop website you can click here.